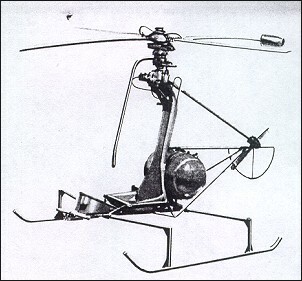 Single-seat open frame ultra-light helicopter with two rotor-tip mounted Wojcicki pulse-jets. Prot. FF 28 June 1957. 2 built. A new jet-powered helicopter, the JK-1 Trzmiel, designed by J. Kotlinski, a former member of Zurakowski's design team, was completed at the I.L. (Aircraft Institute) in the Spring of 1957 and was flight-tested later in the same year. TYPE: Light pulse-jet-powered helicopter. ROTOR SYSTEM: Two-bladed main rotor with small two-blade servo-rotor above main rotor and two-blade tail rotor. Main rotor blades, with a steel spar in the leading edge, are filled with plastic and have sheet duralumin skin. Servo-rotor of two circular planform blades mounted on short streamline stubs. Two-blade small diameter directional control rotor at the rear end of fuselage frame. Total main disc area 38m2. FUSELAGE: Uncovered steel-tube structure. POWER PLANT: Two 11-kg Wojcicki pulse-jets mounted at tips of main rotor blades. 15 minut lotu to mozna poswirowac ;(, w dodatku dwa silniki impulsowe musialy byc bardzo glosne.